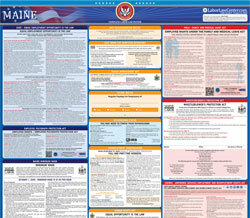 The Occupational Safety & Health Regulations Poster is a job safety law poster by the Maine Department Of Labor. This poster is mandatory for some employers, including employers in the public sector. This poster must be posted in a conspicuous place where all employees in the Public Sector will see it. This poster describes the rights that employees have to safe and healthy workplace as well as how to file for safety and health complaints and who to contact to ask for a health inspection or for some information on safety and health in the workplace. It appears you don't have a PDF plugin for this browser. Please see the link below to download maine-occreg.pdf. Who can you contact to ask for an inspection or for safety and  health information? This poster is provided at no cost by the Maine Department of Labor and may be copied. following Safety and Health Regulations. Department of Labor and request an inspection. inspection of your job site. at or near the place of the alleged violation. face fines, civil charges, or criminal charges. Under a plan approved August 5, 2015, by the U.S.
workers in the public sector throughout the State. Telephone: 617-565-9860 | Fax: 617-565-9827.